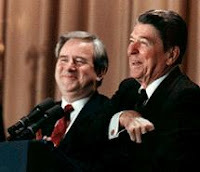 Falwell credited his Moral Majority with getting Ronald Reagan elected. The Rev. Jerry Falwell, who founded the Moral Majority and built the religious right into a political force, died Tuesday shortly after being found unconscious in his office at Liberty University, a school executive said. He was 73. Ron Godwin, the university’s executive vice president, said Falwell, 73, was found unresponsive around 10:45 a.m. and taken to Lynchburg General Hospital. “CPR efforts were unsuccessful,” he said. Graduation weekend at Liberty University is this weekend. * Crooks and Liars pleads with their Leftist commenters to be nice- Oh well, at least they asked. * Democratic Underground– It’s good that the sob is dead. –Jerry Falwell has been dead for two hours. I may not agree with everything that Rev. Falwell said or did, but I know that spitting on a man two hours after his death is a vile practice. HotAir is tracking the blog reaction. Michelle Malkin has reaction to the news. UPDATE: HotAir has a clip of MSNBC using a quote from a Bush-Bash website in their report on Falwell!